I got sucked back into Skyrim this week. My first playthrough didn't get very far; I was tromping around as a Nord warrior, and it didn't really connect me to my choices, and my choices to the story, as much as I would have preferred. 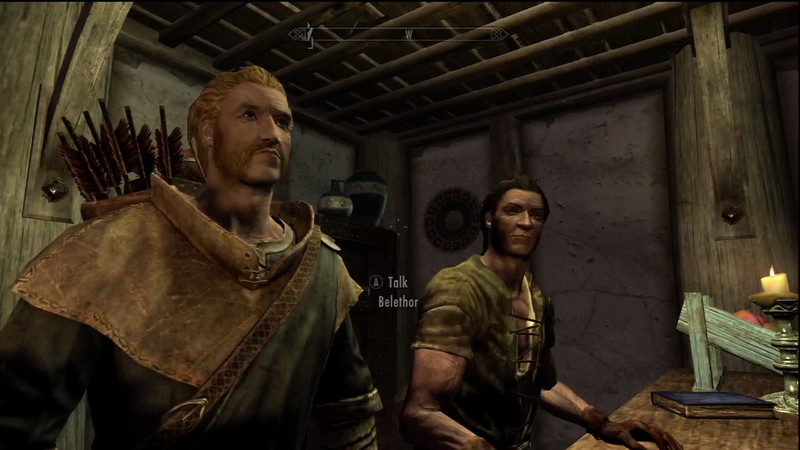 After watching the Grosjean Brothers' hilarious Skyrim 2012 sequel, I decided to re-roll and create "Gregethor," in the image of their friend Greg, who plays the distant descendant of Whiterun's sleazy merchant, Belethor (that picture, above, is of the two meeting). As Belethor is a Breton, I chose that race for my Gregethor, and that made going the mage route more sensible. I decided to play it loosely like old D&D—no armor, but I allowed myself the use of one-handed weapons and, of course, a bow (until I acquired firebolt.) I'm going up the destruction power tree, with some attention to enchanting and alchemy. I know this is the Super Bowl weekend and at halftime, everyone either gets up and takes a dump or plays Madden. I'll probably duck back into Winterhold to clear off some sundry quests and sell loot before catching the second half. That's what I'm playing. What are you playing this weekend?